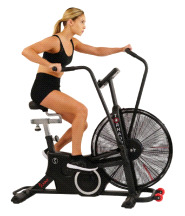 Train like a champion with unlimited resistance on the SF-B2729 LX TORNADO Air Bike by Sunny Health and Fitness. The newest Tornado Air Bike is BIGGER, STURDIER and MORE Durable for the toughest workout. Dimensions: 56L x 22W x 50H inches. The greater your speed and force the more resistance this fan bike can make! The commercial grade oversized 25-inch fan wheel drives unlimited air resistance as you pedal forward with heavy momentum. The stylish red paddles are enclosed in an upgraded fan cover guard to protect from accidental dirt and debris from damaging the fan. Ergonomic extreme grip handle bars are designed to increase muscle engagement in the arms, back, shoulders during the push and pull action. This upright bike is packed full of incredible features. The large multi-function screen displays your fitness metrics simultaneously as your pedaling hard on the fan bike. Receive advanced details on power output (WATT) and cadence (RPM) to determine and gauge workout intensities. The console is BLUETOOTH compatible to receive accurate real-time heart rate readings (Bluetooth heart rate strap not included). Quick Access button features make programming your target goals EASY: Target Time, Target Distance, Target Calories, and Target Heart Rate. Simple Pre-set interval timers are integrated and can be started with one press of the button. Customize your workout intervals with the Custom Interval feature. The heavy-duty steel frame holds an incredible 330LBS which maximizes stability during vigorous rides. Large non-slip foot pedals will keep your feet secure during slow or rapid pedal strokes. Oversized foot pegs allow you to place your feet on them to eliminate the pedaling action, and to emphasize the upper body. (Inseam: MIN/29 MAX/41 inches) Get the right fit with the 4-way adjustable seat to ensure your posture and body mechanics are in the optimal position. Easily transport your bike with the large transportation wheels that will glide easily across carpet or a flat surface. The ultra-durable handlebar on the back of the bike allows you to lift and maneuver your bike effortlessly. Cross the finish line with new goals and better stamina with the SF-B2729 TORNADO Air Bike by Sunny Health and Fitness. If you have any questions, please give us a call at 800-355-2956. - 4 –WAY ADJUSTABLE SEAT: Will allow the adjustment of the seat forward and backwards to find the correct horizontal distance to the handle bars. The seat also moves up and down to find the correct vertical distance to the pedals. - QUICK ACCESS INTERVAL KEYS: Start an onboard interval program with just one press of the button. High intensity intervals 1:2 work/rest ratio or choose a moderate intensity interval 2:1 work/rest ratio. - CREATE CUSTOM WORKOUTS: With the custom workout feature you can design your own intervals. Set your desired work interval and rest interval.